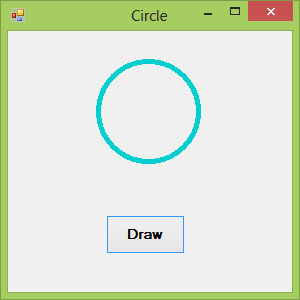 In this lesson, we shall learn how to draw ellipse and circle. First of all, we need to understand the principle behind drawing an ellipse in Visual Basic 2019. The basic structure of most shapes is a rectangle, the ellipse is no exception. Ellipse is an oval shape that is bounded by a rectangle, as shown in Figure 28.1. * Assume you have also already created the Graphics object myGraphics. Where (X, Y) are the coordinates of the upper-left corner of the bounding rectangle, width is the width of the ellipse and height is the height of the ellipse. 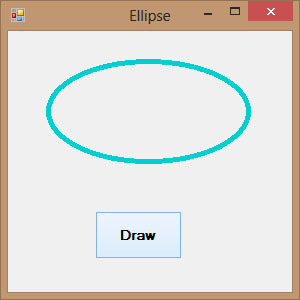 After you have learned how to draw an ellipse, drawing a circle becomes very simple. We use exactly the same methods used in the preceding section but modify the width and height so that they are of the same values. The following examples draw the same circle.